Why not Gogh to an Art Show? MENTOR - Ralph Haehn is a 97-year-old watercolorist who first picked up a brush 20 years ago. Prior to this endeavor, he had graduated from Ohio State University College of Veterinary Medicine, Class of ‘55. He worked for Lake Animal Hospital in Painesville until he retired in his late 70s. Ralph still paints, but only in the winter. Spring, summer and fall are considered the growing and harvesting seasons and during those months, this productive senior can be found out in his garden tending to his crops. Ralph has been hybridizing daylilies for as long as he’s been painting. He’s developed some award-winning lilies. He also won Best in Show for one of his paintings last September during an event put on by the Wildwood Cultural Society in the name of Dorothy McNamara Maloney. How do I know this? My artwork came in second to his at the same show. Artists are often a sensitive breed of people. We are passionate about our paints, paper and brushes. We can become both exulted and deflated over a single painting and, should we enter said painting into a show and it’s overlooked, we convince ourselves the judges were blind. I first met this gentlemanly painter in 1998. We both attended a watercolor class from another artist named John Peters. Thirty-two years my senior, we still became fast friends. Mostly because he liked animals, and partly because he painted on the same level as myself, and I like competition. It keeps me humble. We differ in painting styles only in that Ralph prefers painting scenery, I’d rather paint portraits. Oftentimes photographs are used as references. Usually, painters have to be mindful of their subject matter for fear of copyright infringement. I take my own pictures so I’ve never worried about that aspect. Ralph has oftentimes painted from my photography and has produced magical works of art. I’m always honored to have supplied his inspiration. To put some perspective on how well Ralph paints at the age of 97, I Googled ‘famous artist of all times’ and jotted down the names of those I knew. Andy Warhol, Pablo Picasso, Vincent van Gogh, Leonardo da Vinci, Michelangelo, Henri Matisse and Jackson Pollock. Norman Rockwell didn’t make the list, but I always liked his paintings featured on the covers of the Saturday Evening Post magazines. I also liked most of the cartoonists featured in Mad Magazine so I guess that would explain why art is so diversified, complex and nearly impossible to predict what makes for a masterpiece. Next, I checked the ages of these imaginative people when they died. Andy was 58, Picasso – 91, van Gogh -37, da Vinci – 67, Michelangelo – 88, Matisse – 84 and lastly Jackson Pollock died at 44. In fairness, I should also include Grandma Moses. She started painting at 76 and continued to do so until her death in 1961 at 101 years of age. When Norman died at the age of 84 in 1978, I remember thinking that all of us starving artists raised up one notch on the talent meter. Back then I was an artist, not really starving, actually making a pretty good living working as a designer for trade shows in the land before computers. After the birth of my three children, a time came when I was ready to return to the workforce but, I found I’d been replaced by a creation of Steve Jobs. I could have gone back to school, instead I readjusted my life goals, learned to budget within my husband’s income, and carried on. Creative people just don’t stop being creative, but the ‘starving’ part becomes more attainable. When one doesn’t work outside the home, few are wanting to spend more than garage sale prices for commissioned art. At least that’s been the case for me. I soon stopped creating for others and simply painted to make myself happy. Ralph thinks likewise. The only time he’s sold his work was in exchange for chores done around his home by willing and able grandchildren. He offered them money and the wise kids asked for paintings instead. Once, when some of his work was on display at the Kirtland Farmpark, he was offered $200 for one of his paintings. He turned it down as he paid almost as much to have his work professionally framed. A few months later he entered the same painting in a show and won a $200 prize. Ralph thinks that was his best deal; he made money and still got to keep his painting. After Ralph’s latest Best-in-Show award, the city of Mentor asked if he’d like to put on ‘a one-man show’ featuring 30 pieces of his best work to date. He instead asked if a two-person show was possible and asked me if I’d like to be included. How could I say no? Most art shows are sought by artists looking to make a name for themselves. They hope to attract new clients, build a following and thereby add value to their work. This isn’t the case for Ralph. Or me. Putting on a show takes effort. Mats have to be cut, as does the glass. Frames need to be built or acquired. Hardware must be attached for hanging. The work must be delivered and then hung in a designated place. Then there’s the artist reception. Let’s be honest, sometimes these receptions will only feature an artist… and a few crickets. Who wants to face that sad but possible truth? No matter, I agreed because Ralph’s work should be put on display if only for a few weeks and only for a few people so inclined to attend. He’s good. With all that’s going on in this world today, it’s nice to write about something good. The Unveiled Spotlight Artists show is free (as in no Monet), Monday through Friday, 8 a.m. - 5 p.m., from Feb. 8 – 27 at the Mentor Municipal Center also known as the City Hall. 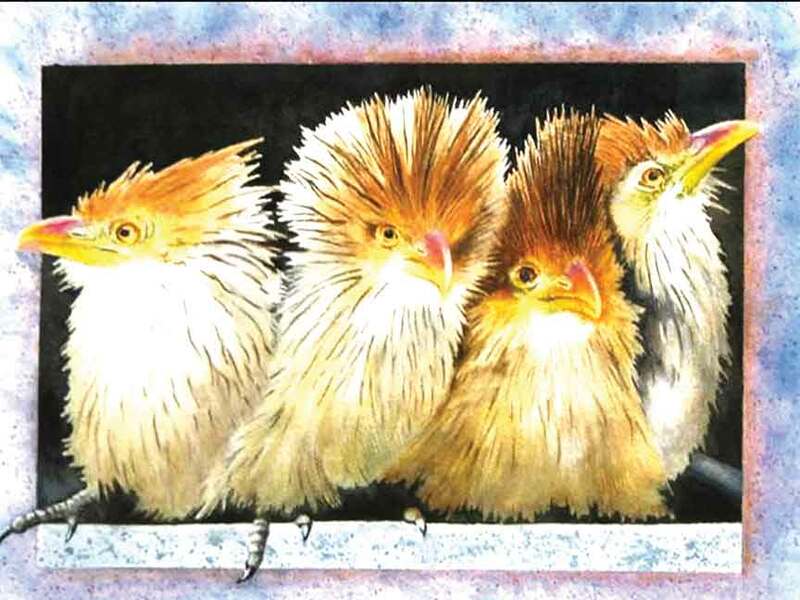 Cuckoo bird fledglings are the subject of a watercolor by Ralph Haehn that can be seen in The Unveiled Spotlight Artists show Feb. 8 – 27 at the Mentor Municipal Center also known as the City Hall. The painting is based on a photo taken by artist, Pat Greene.